If you’re nearing the finish line of an uncontested divorce, you may soon be going to court for the final hearing. This is when you will appear before a family law judge and testify under oath. Knowing what to expect will help you be prepared and can help soothe your nerves if you’ve never been in a courtroom before. An uncontested divorce means spouses have agreed on terms of property division and child custody issues. They don’t need a judge to intervene in any disputes and have signed an official marital settlement agreement. The next step is that one of them or both must appear in court, where the settlement agreement will be incorporated into a final judgment. 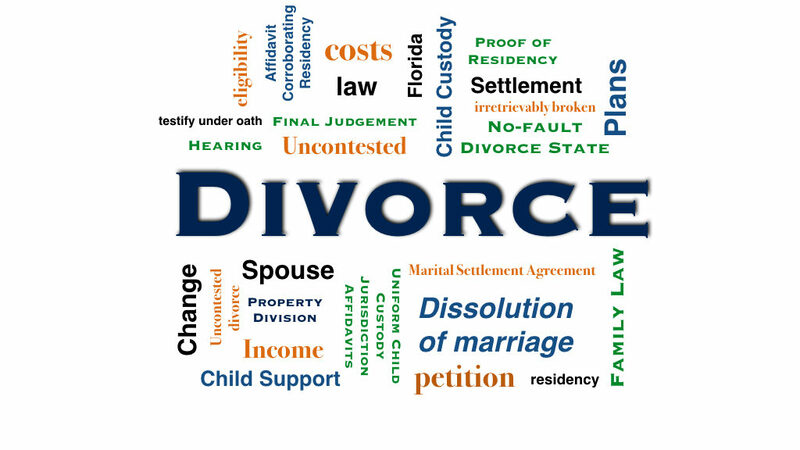 Every judge handles their uncontested divorce dockets a little differently but, generally, the following will apply in most Florida counties. Final hearings don’t take long. The entire process is usually over in less than 10 minutes. You will have to testify under oath that you or your spouse has been a Florida resident for at least six months prior to filing a petition for dissolution of marriage. A Florida driver’s license can be used as proof. Bring a voter’s registration card as an alternative (issued six months before the petition was filed), if your driver’s license or your renewed license is too recent. Don’t have a voter’s card or license? You can have a witness testify to your residency, or have the witness sign a notarized Affidavit Corroborating Residency. Florida is a no-fault divorce state. Legally, you don’t need grounds to dissolve the marriage other than it is irretrievably broken. Remember this, because the judge is going to ask why you’re divorcing and whether the marriage is irretrievably broken. This is not the time to cast stones and spew bitter accusations. The judge won’t want to hear it and frankly, it’s irrelevant, legally speaking. Keep your answer short, such as we grew apart or we don’t love each other anymore or we don’t get along. You also may be asked if you think marriage counseling will assist you in resolving your difficulties. Simply reply, no. You’ll be asked to identify children born of the marriage or adopted and testify that the female spouse isn’t pregnant. Also, you’ll need to identify the signatures on the settlement agreement and testify that you entered into the agreement freely and voluntarily. If you have an attorney, you may be asked if you have been satisfied with his or her services. And you’ll be asked whether you wish the court to enter a final judgment. Many women wish to restore their maiden name after a divorce and petition for a name change. The final hearing is a good time to get this done. This is a legal name change and the judge is required to ask questions about your status and intent. Some of the questions might seem insulting, but don’t be offended; the judge is doing what is required. Questions that may be asked: Have you been adjudicated bankrupt and if so, where and when? Have you been arrested or charged with a criminal offense or been required to register as a sexual predator? Has a money judgment been entered against you? Can you testify that the name change petition isn’t being filed for an ulterior or illegal purpose and that your civil rights have never been suspended, or if so, are they restored? If you have children, the court will make sure that you have filed the form that signifies you have completed the parenting course that Florida requires by law for divorcing parents, and that both parties have filed their Uniform Child Custody Jurisdiction Affidavits. That’s basically what to expect. You will be legally divorced when the hearing is over. Meanwhile, I hope this information is helpful but also recommend speaking with your family law attorney a few days before your final hearing to make sure you are fully aware of what will be happening.